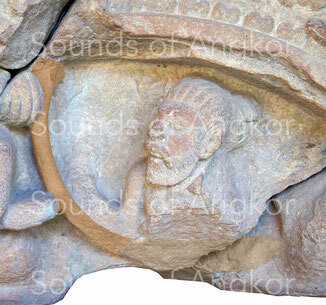 Pre-Angkorian Harp - Site de soundsofangkor ! The harp has probably reached South Asia since the former Near East. There is no tangible proof, but the instrument already exists in the civilization of the Indus (about 3000-1750 BC), a period of commerce with the Mesopotamia. The Sāmaveda (circa 1800-1500 BC) is the first to mention the word vīṇa, a generic term for chordophones for ritual use. The text does not specify whether it is harps, zithers or lutes. Later, around 500 BC, classical Indian literature mentions it as an instrument of court entertainment. 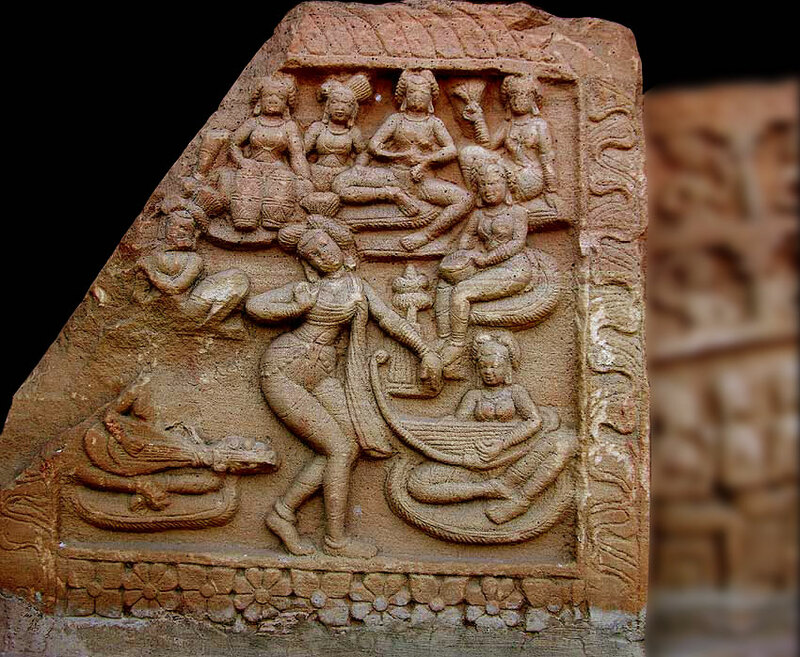 This last role is confirmed through the Buddhist art of 2nd century BC to 6tth century AD where kings, nobles, minor deities and courtesans are represented playing the harp, either solo, or to accompany the song and animate the dance. The harp continues to appear sporadically in the iconography of the end of the first millennium, to disappear gradually in South Asia, with some exceptions: waji from Nuristan, bin-baja of Pardhan from Madhya Pradesh (India), t'na or nade of Karen from Myanmar and Thailand, saùng-gauk of Burmese. 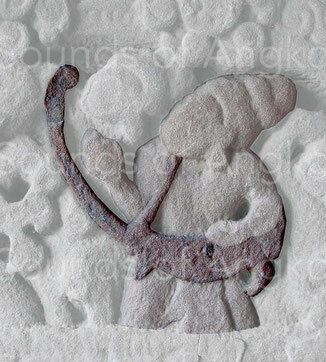 The first representations of pre-Angkorian harps date back from 7th century Two lintels from Sambor Prei Kuk, today in the National Museum of Cambodia, testify to its existence. 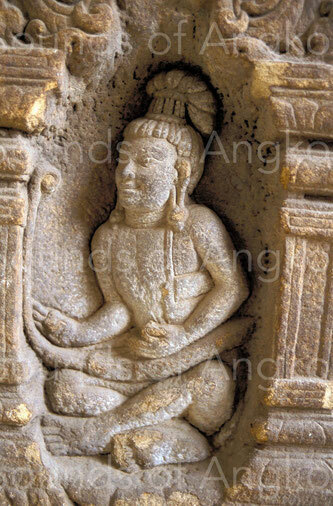 Another one, in Pakse Museum, has been discovered in Laos that formerly partly encompassed in the Khmer Empire. The oldest representations of harps appear in the seventh century on two Sambor Prei Kuk style lintels, now in the National Museum of Cambodia. 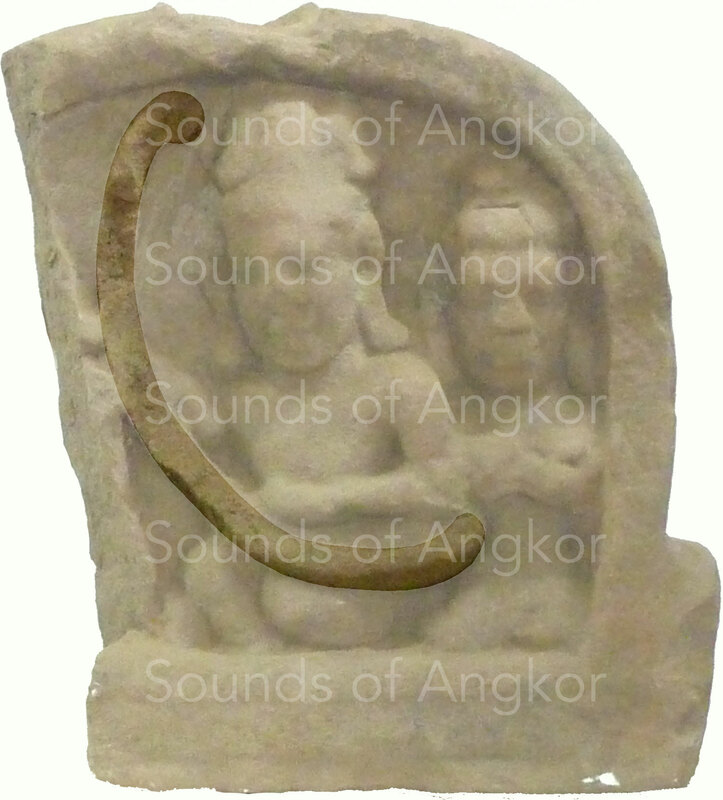 Another is found in the Pakse Museum, discovered on the territory of Laos formerly partly encompassed in the Khmer Empire. Lintel from Sambor Prei Kuk. 7th c. National Museum of Cambodia. The handle of the pre-Angkorian harp ends in a round shape which could well be a volute if one refers to both a Cham sculpture of the same period in Vietnam and another one of the Gupta era in India. As no detail appears on the three Khmer representations above, we will consider this element as hypothetical and designate it as a volute. Indian cordophone of Gupta era,5th century, ending with a volute. British Museum. Cham harp. Early 8th c. Đà Nẵng Museum. Vietnam. Mỹ Son E1. Fragment of lintel from the Pawaya site. Madya Pradesh. India. Gupta Period 4th-5th century. 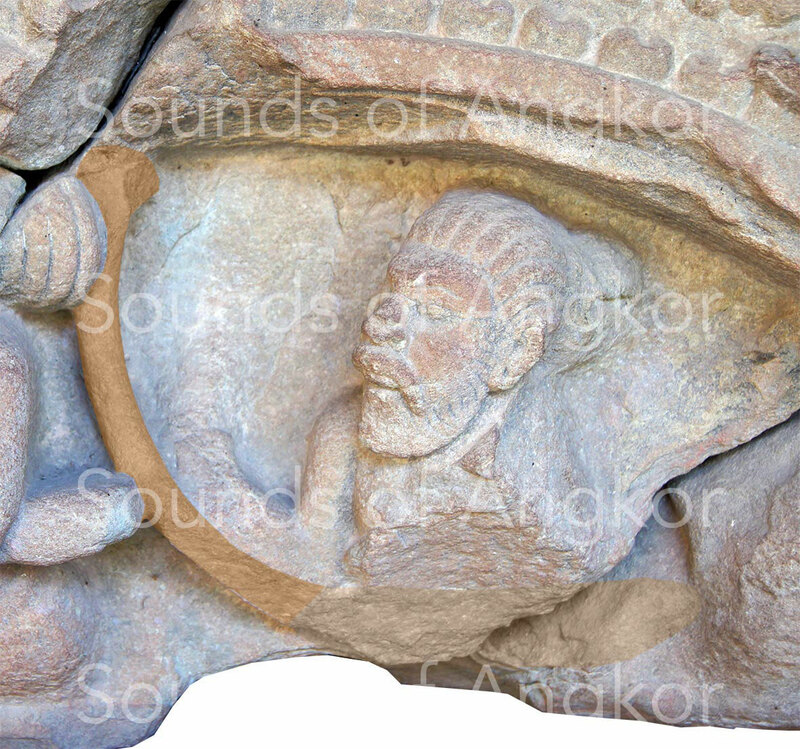 The recent discovery for us (October 2018) of the existence of the lintel of Pawaya, visible in the Gujari Mahal Archeological Museum also known as the Gwalior Fort Archeologic Museum, confirms several points of organology present on our reconstruction's work of the pre-angkorian harp. 1. The general arched shape of the harp is confirmed. 2. A volute is present at the top of the neck. 3. The necklaces that attach the strings to the neck are perfectly visible. 4. The number of strings seems to be seven even though this type of data is still to be taken with caution. However, he tells us that he is neither very inferior nor superior. This data can easily be adapted to each production. 5. The sculpture also shows us that a skin had to be used to make the soundboard; it stops at the base of the neck. On the other hand, we don't know if the instrument had feet to keep it standing when it was not played. In a general way, everything is quite precise in this relief, both on the organological level and in the musician-instrument relationship. In addition, the composition of the orchestra is similar to the lists of instruments of the Lolei temple (9th century). In the ancient Khmer epigraphy, the harp is invariably referred to as vīṇa. However, the word is ambiguous as it refers to a wide range of string instruments in India, especially the stick and tube zither. In India, a prefix or suffix specifies the nature of the vīṇa. In Cambodia, it is necessary to distinguish texts in Sanskrit from those in ancient Khmer. If it is proved that this term designates the harp in ancient Khmer, it must be translated as "zither" in Sanskrit texts.
. The inscription of Prasat Komphus (K.669) (972-973 AD) teaches us that the temple received ten harps made of copper alloy and other one of silver. The Khmer harp, which has probably been missing since the 14th-15th centuries from Cambodia, fantasize generations of musicians and intellectuals. The ethnomusicologist Patrick Kersalé has been exploring remote areas of Southeast Asia and India for more than 20 years, tracks the footsteps of this legendary instrument to try to unravel the mystery. 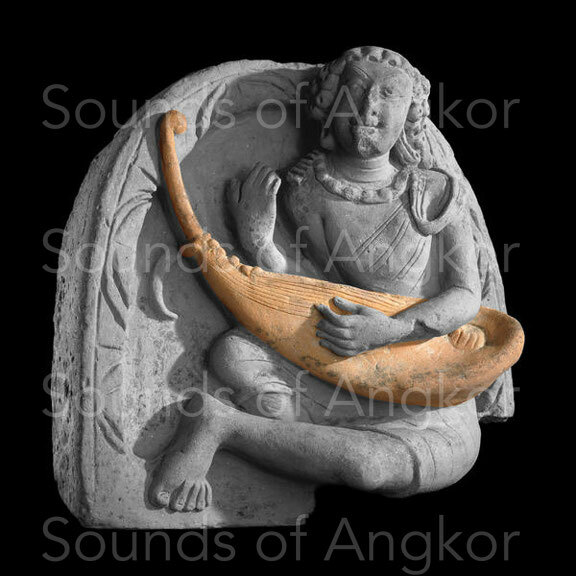 His dream: to rebuild the Angkorian harp and restore the orchestras of the glorious past of the Khmer Empire.